Beautiful as they are, a weeping form is not always what you need. For an upright form, choose the Emperor Japanese Maple, which is small tree growing to around 15 feet, known for its beautiful red foliage. In spring the leaves emerge a rich purple-red and that color is held all summer, unlike other red-leaf Japanese Maples which can fade to a dark green. This summer color is followed by a spectacular fall display of vibrant scarlet. 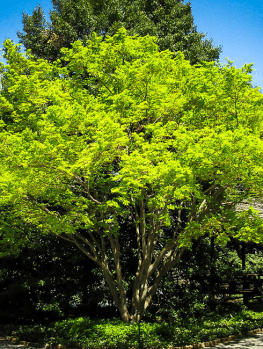 This tree is faster-growing than many other Japanese Maples, so it will not be long before you have a good-sized tree to grace your yard with the special beauty of these rare and sought-after specimens. Especially in colder northern areas, the late appearance of leaves in this variety gives protection from spring frosts that can damage other Japanese Maples. Green is a very nice color and of course plants have green leaves, but in the garden we often want to see more colors than just different shades of green. This can be done by endlessly and expensively planting annuals and flowering plants every year, but a better, low-maintenance approach is to use shrubs and trees with colored foliage, so that every year the color appears without any trouble or work and beautifies your garden. 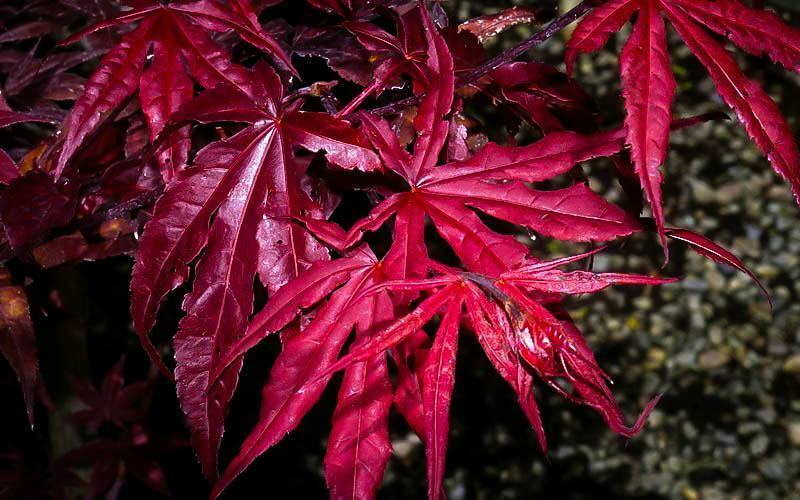 Red is a very popular color for foliage plants and when it is found on a Japanese maple, those queens of the garden that everyone wants to have, then this is indeed something special. The traditional red-leafed Japanese Maple is an old variety called Bloodgood. It can be seen in many gardens and is an attractive tree, particularly in spring. However, by mid-summer (especially in warmer regions) the leaves have usually faded to a muddy-green color and look tired and uninteresting. The Emperor Japanese Maple is a newer variety that was specially bred to overcome this problem and it does. The Emperor Japanese Maple retains its brilliant spring-red foliage color all summer long, looking fresh and bright for the whole season. As fall sets in it turns spectacular shades of scarlet as a grand finale, before going to sleep for the winter. Even at that time the delicate structure of the stems laced against a snowy background or a blue winter sky gives beauty at that ‘down time’ in the garden. 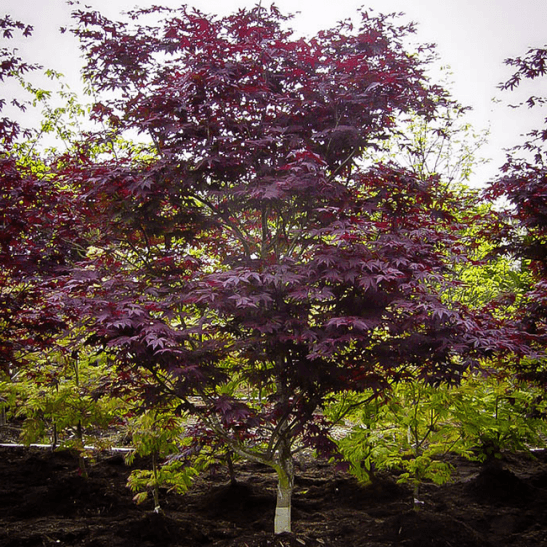 The Emperor Japanese Maple is quick-growing compared to many other kinds of Japanese Maples and it will soon mature into a tree just 15 feet tall, perfect as a specimen in a smaller garden or as a beautiful addition to a shrub bed in a larger garden. This maple is upright in growth and forms a vase-shaped tree branching low-down and often with several main stems. It also makes a beautiful terrace tree grown in a large pot. It has much broader leaves than many other forms of Japanese Maples and the leaves are a little like miniature versions of regular Maple Trees, but much more pointed. The leaves have 5 to 7 lobes running about ¾ of the way into the leaf, which is 2 to 4 inches long, so it resembles a tiny hand with fingers. In spring they emerge a rich, dark purple-red and hold that rich color all summer, unlike older varieties like Bloodgood which turn a dirty color in summer. In fall the leaves turn a rich and brilliant scarlet, turning your specimen into a new a vibrant feature in the garden. This tree grows from zone 5 to zone 9, so it can be grown almost everywhere outside of the coldest regions of the country. It grows best in well-drained soil that is rich in organic material and does best in soil that is not too alkaline. It should be grown in full sun in cooler zones to give the best leaf color and since the leaves are larger and not as finely divided as some Japanese Maple varieties it will not burn so easily in the sun. In warmer zones it will do best with some shade in the afternoons to protect it from the most intense periods of sun-shine. It should not be allowed to become completely dry, so regular summer watering is the only kind of maintenance needed. To plant your Emperor Japanese Maple, choose a suitable location and dig plenty of rich organic material – compost, manure or peat-moss – into the soil. Plant your tree at the same depth it was in the pot and place it in a hole that is three times the width of the pot. Replace most of the soil, firm it down gently around the roots and water well. Replace the rest of the soil when all the water has drained away. Put rich organic mulch over the root-zone but not touching the trunk and add new mulch each spring to both feed your tree and conserve moisture. Water well at least once a week for the first season or two and then water your tree whenever the soil becomes dry. Pruning is not necessary as this tree will naturally grow into a beautiful form. 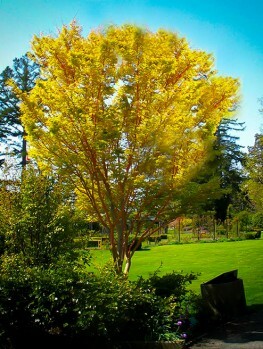 A major problem with Japanese maples is their tendency to leaf-out very early in the spring. At the first sign of warmer days they begin to grow and if there is a late spring-frost in your area the leaves will be damaged. A major feature of the Emperor Japanese Maple is that it leafs out a full two weeks later than other Japanese Maples do, so it is much less likely to be caught by a late frost. It is therefore an exceptionally good choice if you live in areas where these frosts happen often during your spring. The Japanese Maple (Acer palmatum) grows wild in Japan, China and Korea. It is naturally variable and unusual forms have been collected by the Japanese for many centuries, so that there are literally thousands of different forms. Many are quite similar and only of interest to collectors, by the Emperor Japanese Maple is unique and very desirable to anyone who loves beautiful plants. It was bred by the famous Monrovia nursery in California and introduced in 1998. It full name is Acer palmatum ‘Wolff’, although it is usually sold as the Emperor Japanese Maple. Because of its special breeding, this tree must be reproduced only from correctly identified parent plants. Stem pieces are taken and grafted onto roots from seedling Japanese maples. This is highly-skilled work and the trees take time to grow and develop. Beware of cheaper seedling trees that will be variable and lack the precise qualities of this special variety. 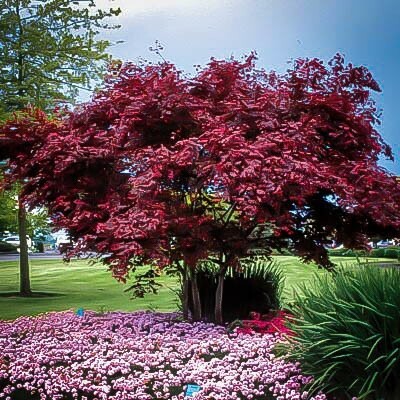 Trees simply labeled ‘red-leaf Japanese Maple’ will definitely not be this special, licensed variety and will perform poorly and be a disappointment in your garden. Our Emperor Japanese Maples are true to the correct form and we receive new stock regularly. However, this tree is in high demand and it can often become unavailable, so order now to avoid disappointment and to enjoy the special beauty of this tree.